January 2016 update – Progress! We submitted a funding application to Sport England to help fund the Changing Rooms next to the MUGA. 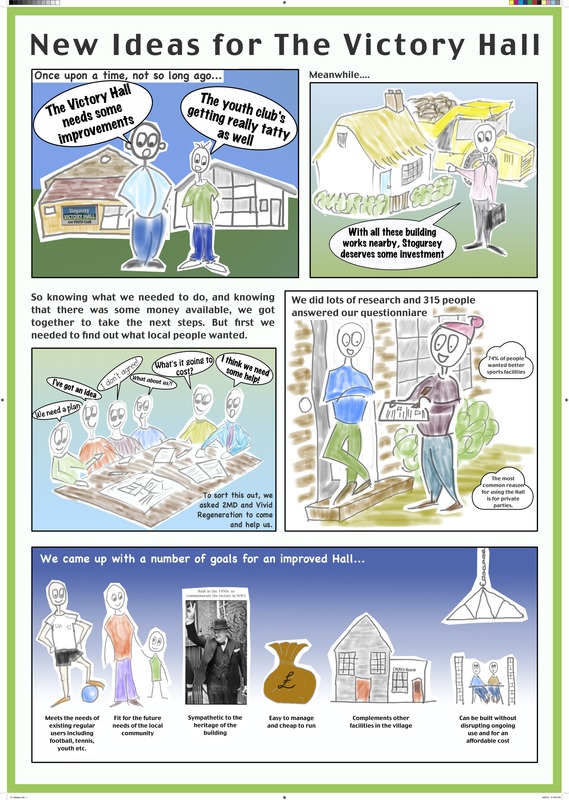 We submitted an application to Awards for All to develop use of the hall via taster sessions, work with young people on the designs, run research visits to other halls and provide governance training. The project will be run with Kilve and Holford village halls. West Somerset Council approved the £400k allocation from the Stogursey Sports and Leisure fund. In particular it was noted that there had been a very impressive 25% response rate. Members said they felt it was an excellent flagship project which would be of huge benefit to the community and a great legacy. In December the Parish Council agreed that the proposals be funded by £400k from the Stogursey Sports and Leisure fund and £200k from the Stogursey CIM fund. At the end of October the Victory Hall AGM the Management Committee voted, by a large majority, to accept the recommendations in the Feasibility Study Report and agreed that we should move onto the next stage of the project. The feasibility study was completed last October. The recommendation is to pursue the hybrid design consulted on in the summer. The estimated cost is £2.4m and operating costs are likely to be c.£23k. 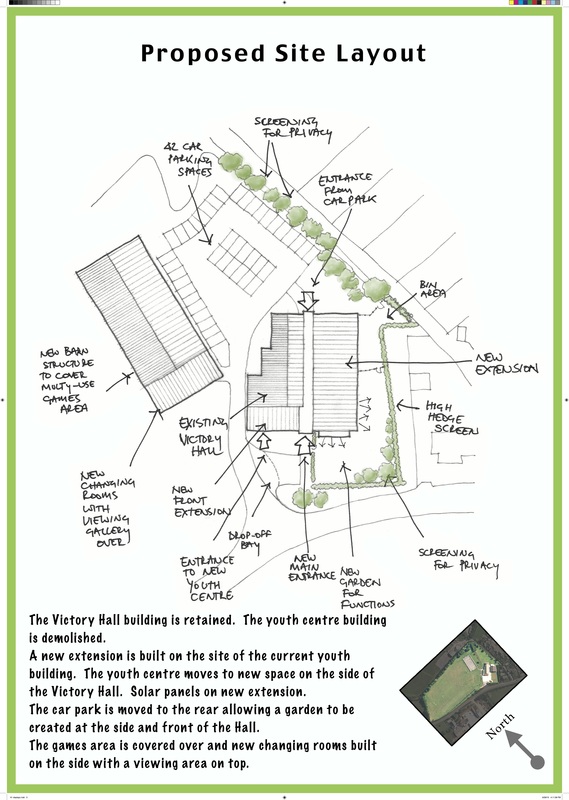 Over the summer we consulted on the preferred option for the future of Victory Hall. Of 72 people stating a preference, 65 said they supported or strongly supported the proposals. There were a number of issues emerging, not least the impact upon neighbours and this lead to some amendments to the hybrid option. The people of Stogursey have approved a report that details how the Victory Hall should be redeveloped. The next step will be to apply for funding for the works, estimated at £2.5m. The consultants who have worked up the proposals, 2MD Regeneration and Vivid Regeneration, will be retained to work on the fundraising and the process of securing planning permission. Consultation on the new design proposals took place in July. This included production of a leaflet which was delivered to every household and available through local outlets a meeting with the Victory Hall Committee on 12 June, a public meeting on 8th July and two weeks of displays at local venues including Victory Hall itself, the Church Rooms, the Greyhound Inn and St Audries Close. Of 79 people who expressed an opinion, 72 supported or strongly supported the proposals. We also received lots of written and verbal comments. You can read the results of the consultation in this report (click for 1.5Mb pdf). We’ll now consider the detail of what everyone said and amend the designs before presenting them to the Victory Hall Committee for their approval. Thank you to everyone who took the time to complete the questionnaire about the future of the Victory Hall earlier this year. We had over 300 responses which was fantastic. We have incorporated your ideas into the latest plans and we would now like to invite you to come to one of the meetings, drop-ins or exhibitions over the next few weeks so that you can see what we have come up with, and say what you think. We aim to get a flyer through every door so look out for this. We are looking for volunteers to help us do the leaflet drop on the morning of Monday 6thJuly – if you can help please let us know. The main event will be a drop in at the Victory Hall from 7pm on Wednesday 8th July. Everyone is welcome and we do hope you can come along! Pop Up Sport is a low key informal programme aimed at village hall and community hall type spaces. The programme can be aimed at inter-generational projects but has been mainly used in the daytime for retired, older, local people as a social and active local opportunity organised. Pop Up Sport consists of 4 sports; archery (with non-pointy arrows), mini tennis, badminton, table tennis and boccia (a seated game which is a mix between bowls and petanque). Different indoor spaces will use the equipment differently but during the summer non-windy months then some can go outside if available. It has proved very popular in rural places where access to sport and recreational opportunities is more challenging due to transport. Usually a village would charge a small amount to cover a cup of tea and biscuit (often 50p or £1). Pop Up Sport is organised by community volunteers either on a rota basis or a focused on a couple of people who have happily taken charge and driven the programme. The training on 10th July is an informal look at how to set up the hall, some risk assessment and health and safety plus a play on each piece of equipment to look at its flexibility. Training is no longer than 3 hours and very informal, more of an induction. The equipment is worth about £400 and Somerset Activity and Sports Partnership (SASP) provide insurance for the trained facilitators whose job is to really chat to people and encourage them to play. Stogursey will be the first community to use the equipment for a period of six weeks at the Victory Hall. After the six weeks in Stogursey the equipment will be passed on to the next parish for them to trial. If the trial is successful we will be able to apply for a grant for our own equipment. West Somerset Council have managed to secure funding to provide training for volunteers in your community to deliver ‘pop-up sports sessions’ in Stogursey. We hope that two people will volunteer to take part in the training morning. If you would like to register for training or need more information, please contact: Colin Johnson -CJohnson@sasp.co.uk or 01823 653 990. 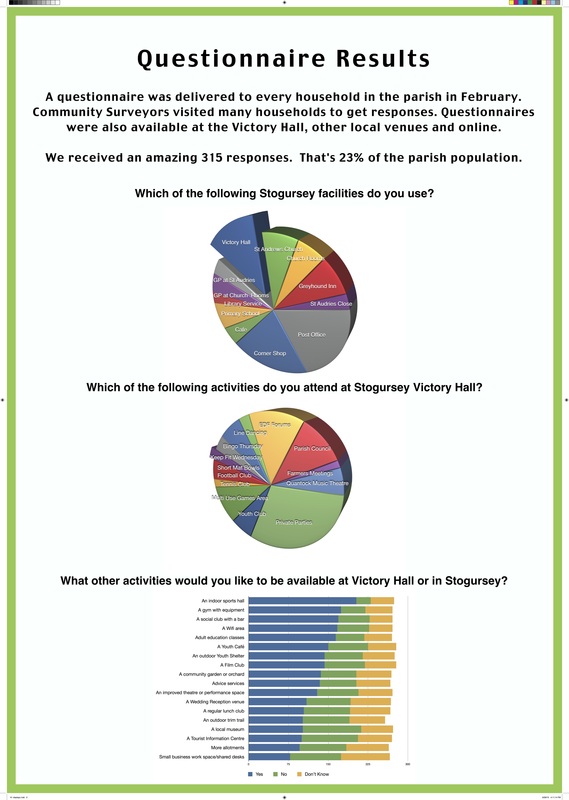 Residents of Stogursey Parish have been giving their views on the future redevelopment of the Victory Hall. Built by villagers after the Second World War, the Hall has been well used and is greatly valued by local people. The management committee, with support from West Somerset Council, have decided it is now time to further improve the hall for the next generation. Five local people were trained as community researchers and have been door knocking the parish asking people what improvements they want and what activities they would like to see on offer in the future. The management committee were hoping to collect 100 views, but a staggering 315 residents have had their say, residents of all ages including those who have recently arrived in Stogursey as well as those who have lived in the Parish all their life. Among the most popular requests for the hall included; An indoor sports hall, a gym with equipment, a social club with a bar, a Wi-Fi area, adult education classes, a Youth Café, an outdoor Youth Shelter and a Film Club. 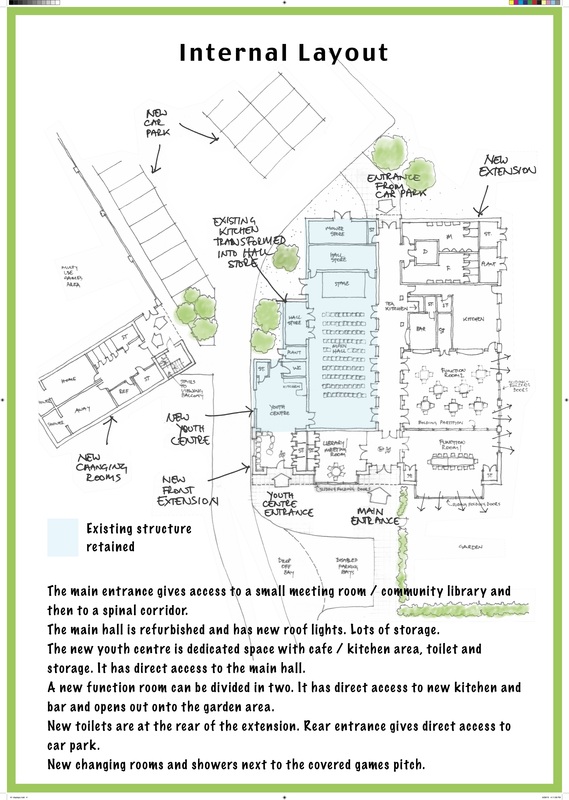 A newly refurbished and extended Victory Hall could include an all-weather sports pitch, new changing rooms, an additional function room and meeting rooms, a new youth café, a larger kitchen and bar, and Wi-Fi and hearing loop capability. Draft proposals will be published in June.